Mayor Martin Walsh was the guest speaker at the Jordan Boys and Girls Club Breakfast Series Feb. 14 at the club’s facility in Chelsea. Walsh, who is serving his second term as mayor of Boston, drew one of the largest crowds in the 23-year history of the monthly breakfast that has featured such prominent guest speakers as Gov. Charlie Baker, former Govs. Deval Patrick and Michael Dukakis, former Gov. and current U.S. Sen. Mitt Romney, former Congressman Mike Capuano, former Boston Mayors Kevin White and Ray Flynn, former State Secretary of Housing and Economic Development Jay Ash, Bob Reynolds, Peter Lynch, and Boston professional sports team owners Bob Kraft, Wyc Grousbeck, and John Henry. Mr. Kraft’s son, Josh, is the former executive director of the Jordan Boys and Girls Club and the current CEO and president of the Boys and Girls Clubs of Boston. Breakfast Chair Mark Robinson joined Josh Kraft in welcoming Walsh to the breakfast during introductory remarks. “Mayor Walsh is a great resource for the city of Boston, he’s a community guy and understands the city on every level and he’s a Boys and Girls Club alum,” added Kraft. Walsh addressed issues such as affordable housing, transportation, education funding, economic development, the environment, and veterans’ homelessness, in a speech that was frequently interrupted by applause in appreciation of his many accomplishments as the city’s chief executive. Walsh said in an effort to bring new businesses to Boston, his administration created an office of economic development. “In that office, we brought in all small businesses and all the different departments and we put them under one umbrella, one roof,” said Walsh. State Sen. Sal DiDomenico of Everett, State Rep. Dan Ryan of Charlestown, Chelsea City Manager Tom Ambrosino, and Chelsea City Councillors Leo Robinson were among the public officials in attendance at the breakfast that is a fundraiser for the Jordan Boys and Girls Club. Leo Robinson, a long-time city official, said he was impressed by Walsh’s speech that highlighted the city’s approach to the opioid crisis and his continuing efforts in addressing veterans’ homelessness, and the need for affordable housing. Saul P. Kraft of Chatham, formerly of Malden, husband of the late May Kraft, passed away on Tuesday Jan. 22, at age 94. In 1968, Attorney Kraft founded the law firm of Kraft and Hall in Chelsea where he practiced law for almost 50 years. He was a member of the Massachusetts Bar Association and past president of the Suffolk County Bar Association. He was a graduate of Boston Latin School, Boston College, Hebrew College and Boston University Law School. Mr. Kraft is survived by his son Dr. Philip Liston-Kraft and his husband, Dr. Edward Liston-Kraft of Chatham; his daughter Atty Bernice Kraft-Levin and her husband Atty Mark Levin of Assonet; his grandsons Dr. Seth Levin of New York City and Dr. Scott Levin of Boston and his sister, Frances Pearlman (husband David Butters) of Swampscott. Mr. Kraft was the brother of the late Sumner Kraft and Leon Kraft. Private funeral services were entrusted to Auclair Funeral Home, Fall River. In lieu of flowers, please consider a donation to: Hebrew College. Att. Development. 160 Herrick Road, Newton Centre, MA 02459. Online guest book at AuclairFuneralHome.com. Susie (DeSisto) DiRosa of Revere died on Jan. 27. Susie worked many years as a seamstress in the Garment district and Revere Public Schools Cafeteria Department. She was the beloved wife of the late Pasquale “Tony,” devoted mother of Suzanne DiRosa of Danvers and the late MaryEllen Lucia; cherished grandmother of Brian and Michael Lucia, great-grandmother of Christopher Lucia and the dear sister of the late Joseph DeSisto, and Christie DeSisto. She is also survived by many loving nieces and nephews and her Feline companion Misty. Her Funeral will be from the Paul Buonfiglio & Sons-Bruno Funeral Home, 128 Revere St, Revere on Friday, Feb. 1 at 9 a.m. followed by a Funeral Mass in St Anthony’s Church at 10 a.m. Relatives and friends are kindly invited. Visiting hours will be on Thursday from 4 to 8 p.m. Interment will be in Woodlawn Cemetery. For guest book please visit www.Buonfiglio.com. Margaret E. (Casucci) Lewis of Chelsea died on Jan. 23. She was the devoted wife of the late Kenneth T. Lewis, beloved mother of Louise Sullivan, Jody Sullivan and Kimberley Rosario, all of Chelsea; dear sister of Augustus Casucci, Sr. of Chelsea, Rosemary Pothier of New Hampshire and the late Richard Casucci; cherished grandmother of Julian Montenez, Jeremy Rosario, Augusto Rosario, Jr., April Garcia, Augustin Rodgriguez, Felix Menendez, Jr., Michael Guzman, Khianna Bedford, Xavier Bedford, Ivelisse Rentas and Zuilda Rosario. She is also lovingly survived by her great-grandchildren, Angelique, Alexis, Ariel, Felix III, Daniel. Michael Jr., as well as many nieces and nephews. To send a message of condolence to Margaret’s family, visit www.smithfuneralhomes.com. Maria Obdulia Pineda passed away on Saturday, Jan. 26 at Boston Medical Center after a long illness. She was 85 years old. Born and raised in Chalatenango, El Salvador, she was one of four children of the late Ancelmo Pineda and Natalia Aguilar. She married Santos Alberto Pineda, and together they shared over 60 years together raising their family of seven. Maria devoted her life to home and family in Chalatenango and recently came to the area to take residency with family during her illness. In addition to her parents, Maria was also predeceased by a sister, Christina Pineda. She is survived by her beloved husband, Santos Pineda of Malden. She was the devoted mother of Dilia Pineda and her spouse, Francisco Mendez, Jose Pineda, Blanca O. Pineda and Ana B. Pineda, all of Chalatenango, Elsa Pineda of Malden, Santos Pineda and his spouse, Anamin Tejada of Everett and Mario Pineda of Chelsea. She was the dear sister of Ernesto Pineda and Domingo Aguilar both of El Salvador and the special grandmother of Ronald Mendez, 18 additional cherished grandchildren and four great-grandchildren. Her funeral will be held from the Frank A. Welsh & Sons Funeral Home, 718 Broadway, Chelsea on Friday, Feb. 1 at 9 a.m. followed by a Funeral Mass at St. Rose Church, 600 Broadway, Chelsea at 10 a.m. Services will conclude with Interment at Holy Cross Cemetery, Malden. Relatives and friends are most kindly invited to attend. Arrangements are by: Anthony Memorial – Frank A. Welsh & Sons Chelsea, 617-889-2723. Josephine P. “Chickie” (McClean) DeCain entered into eternal rest Sunday afternoon, Jan. 27 at the Cambridge Health Alliance Hospital in Everett surrounded by her loving family. A few months short of her 100th birthday, Chickie was 99 years old. Born and raised in Charlestown, the daughter of the late Henry and Josephine (Frazier) McClean, Chickie attended Charlestown Public Schools and graduated from Charlestown High School, Class of 1938. As a young woman she worked at the Charlestown Navy Yard as a crane operator moving sheet metal. She later met her beloved husband, the late Dante D. DeCain, Sr. The couple married and settled in Chelsea, where they raised their five children. As a homemaker, Josephine enjoyed tending to her family and her home. She and her husband, Dante, were the former owners and proprietors of the Little Brown Jug in Chelsea. Josephine would help out in the restaurant by waitressing but her passion was being home with family. She will be truly missed by all who loved her. Chickie was predeceased by her beloved husband, Dante D. DeCain, Sr. and her son, Richard “Deacon” DeCain. She is the beloved mother of Patricia “Patsy” DeCain of Charlestown, Dante DeCain, Jr., Diane Maslowski, and Joan DeCain, all of Chelsea; sister of the late Evelyn Ruiz, Henry, William and George McClean; dear aunt of the late Evelyn “Tootsie” (Ruiz) Sullivan and is also lovingly survived by three grandchildren: Christopher Maslowski of Georgia, Tracy Maslowski and Derek Maslowski, both of Chelsea. Relatives and friends are respectfully invited to attend Josephine’s visiting hours in the Carafa Family Funeral Home, 389 Washington Ave. Chelsea, on Friday, Feb. 1 from 3 to 7 p.m. Her funeral will be from the funeral home on Saturday, Feb. 2, at 9 a.m.. followed by a Mass of Christian Burial at Our Lady of Grace Church, 59 Nichols St., Chelsea, at 10 a.m. Services will conclude with interment at Woodlawn Cemetery in Everett. Judelia “Julita” (Calderon) DeCamacho passed away at the age of 103 on Sunday, Jan. 27 at the Mass. General Hospital in Boston. Born and raised in Palmiera, Colombia, S.A. she was a daughter of the late Manuel Calderon and Josefa Garcia de Calderon. She married Francisco Camacho and they shared 41 years together until the time of his passing. She raised nine children at home and has been a resident of Chelsea since 1978. Julita was devoted to home and family where she enjoyed caring for and being surrounded by her many grandchildren and great-grandchildren. She loved cooking and preparing meals for her family, listening to music, watching her Spanish soap-operas, knitting and walking to downtown Chelsea to visit her favorite music stores; Casa Ortiz and la Princesita. She lived a vibrant energetic life, maintaining her wit, humor and love all of her 103 years. In addition to her parents, Julita was also predeceased by five siblings in Colombia: Copertino, Manuel, Alfonso Josena and Elvira; her beloved husband, Francisco Camacho and a son, Francisco Javier Camacho. She is survived by her loving children: Alda Valez of Chelsea, Jose A. Camacho and his spouse, Anna of Cali, Colombia, her twins: Anselmo Camacho and Margarita Calixto, both of Chelsea, Arnold Camacho and his spouse, Aida of Colombia, Josefa Diaz of Elizabeth, N.J., Julio Camacho and his spouse, Amparo of Colombia and Norma Gonzalez of Chelsea. She was the adored grandmother of 12 and cherished great-grandmother of 22. Her Funeral Mass was celebrated on Wednesday in St. Rose of Lima Church. Interment followed in Woodlawn Cemetery, Everett. Arrangements were given to the care and direction of the Anthony Memorial – Frank A. Welsh & Sons Chelsea. For online guest book or to send expressions of sympathy, please visit: www.WelshFuneralHome.com. Chelsea City Manager Jay Ash took the city to the Rocky mountaintop in June, helping the community earn the prestigious All-Amerca City Award at the National Civic League Competition in Denver. Local business and community leaders say Jay Ash has been an excellent leader of the city where he grew up, attended high school, and starred on the basketball court. The tributes to Ash’s exceptional leadership poured in Wednesday from people who woke up to the front-page news that the 6-foot-7-inch city manager had accepted a position in Governor-elect Charlie Baker’s administration. Susan Gallant, past president of the Chelsea Chamber of Commerce who has a Certified Public Accounting practice in the city, wished Ash well in his new Governor’s Cabinet position as the secretary of housing and economic development. Josh Kraft, Nicholas president and CEO of the Boys and Girls Club of Boston, praised Ash’s leadership and his commitment to the city. “Jay Ash was instrumental in helping to transform the city of Chelsea through his leadership and commitment,” said Kraft. “Jay had an unbelievable vision and commitment to making Chelsea the best small city in Massachusetts. Through his work in economic development and his collaboration with community organizations and families, he changed the complexion of a city that was in tough shape for many years. 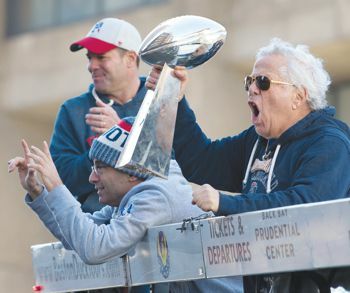 “There is no doubt in my mind that he will bring that same passion and commitment to the state and all of us across Massachusetts will benefit,” added Kraft. The former executive director of the Jordan Boys and Girls Club on Willow Street thanked Ash for his assistance in the construction of a new state-of-the-art clubhouse for the benefit of Chelsea youths. Chelsea High director of athletics Frank DePatto, one of the city manager’s mentors and close friends, said that his positive imprint on the city will be remembered for years to come. John Ruiz, who became the first Latino heavyweight champion of the world and has a city park named in honor, said he will always be grateful to Ash’s support of his boxing career.